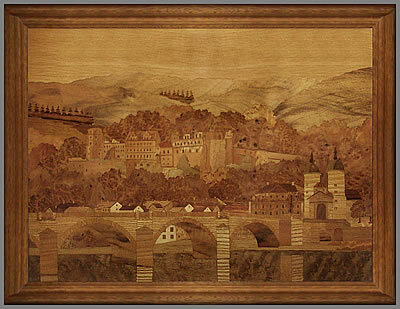 July's update brings you some interesting marquetry or wood inlay pictures that, at first glance, appear to be Buchschmid and Gretaux works. But on closer inspection these very attractive pictures seem to have originated somewhere different to the Buchschmid and Gretaux workshops in Heidelberg. Check them out and see if you can provide an answer to who was the actual maker of these rather fine marquetry/wood inlay pieces. 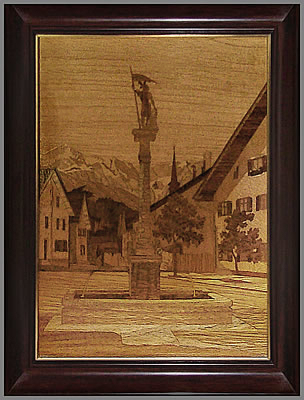 Our July 2012 update brings you some very interesting marquetry (or wood inlay) pictures in the, more usual for these pages, Buchschmid and Gretaux wood inlay style. These four pictures were bought in an Antiques store/shop in Hot Springs, Arkansas USA by Ingrid Monk in 2007. The top three pictures you see here are not signed, but have paper label on the back stating what they are, the fourth picture down is the largest of the pictures and is signed (under the mans feet), Joe Lachmar 1985. From the spelling of the word "colored" as seen in the label in picture 5 on this page, we would assume that these pictures could have originated in America. The spelling of the word "colored" in Europe is "coloured". So, that may possible be a small clue as to where these excellent marquetry or wood inlay pieces originated from. Tracing the work back to the maker or originator of a marquetry/wood inlay piece is a tricky job. Unlike most standard pieces of art work where the style and brush work can be referenced back to a particular artist, there are no real directories or records as such of the works of particular marquetry artists. If a piece is signed in the manner of the Buchschmid and Gretaux "BG" - then we have a very good indication as to who made the piece. 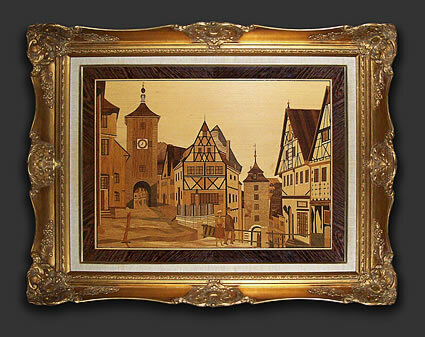 But, in general, most marquetry or wood inlay artists do not place a signature or logo on their work. 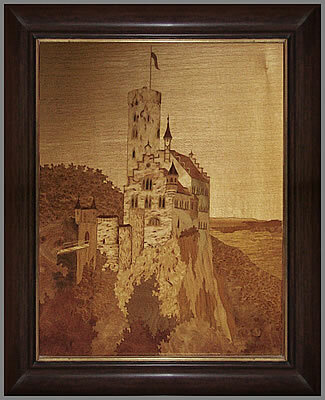 This is unfortunate because we are often asked if we can place an unsigned picture to a marquetry artist. Our reply for a good 90% of the time is that, as there is no directory or "who's who" of marquetry artists in the same way as you have established reference points for conventional artists, we are sadly at a loss to be able to give a definitive answer. Generally if the marquetry piece in question was made by a member of the Marquetry Society or the American Marquetry Society or the Australian Guilds etc, then we have good reference points to work from. In particular, our own Marquetry Society records of our member's work (as entered into our National Exhibitions) goes back to the very early 1950's, and therefore the works in question can be traced back and the relevent information provided with good assurity of accurate information. 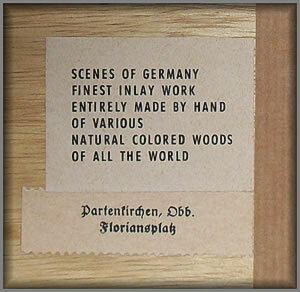 The same, we are sure, applies to the other marquetry associations in our global family of marquetry enthusiasts. However, commercial and independent producers of marquetry and wood inlay pictures and suchlike pieces do very rarely make available catalogues listings of their works. The lack of such information therefore makes the task of identifying the corresponding works a very difficult task, as we are sure you can imagine. Click the above button to return to page 40 of "Can You Help"